Neil Richard Gaiman is an English author of short fiction, novels, comic books, graphic novels, audio theatre and films. His notable works include the comic book series The Sandman and novels Stardust, American Gods, Coraline, and The Graveyard Book. 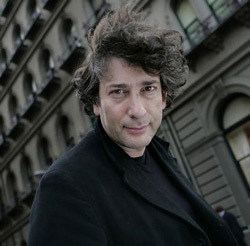 Gaiman's writing has won numerous awards, including Hugo, Nebula, and Bram Stoker, as well as the 2009 Newbery Medal and 2010 Carnegie Medal in Literature. He is the first author to win both the Newbery and the Carnegie medals for the same work. You give them a piece of you. They don't ask for it. They do something dumb one day like kiss you, or smile at you, and then your life isn't your own anymore. Love takes hostages. It gets inside you. It eats you out and leaves you crying in the darkness, so a simple phrase like "maybe we should just be friends" or "how very perceptive" turns into a glass splinter working its way into your heart. It hurts. Not just in the imagination. Not just in the mind. It's a soul-hurt, a body-hurt, a real gets-inside-you-and-rips-you-apart pain. I hate love.  from "Sandman: The Kindly Ones"